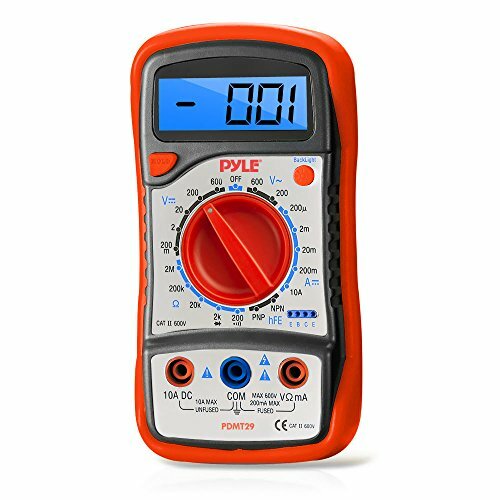 This conveniently sized PDMT29 Digital LCD Mustimeter, AC, DC, Volt, Current, Resistance & Range with Rubber Case & Standby Pyle is perfect for measuring DC and AC voltage, DC current, resistance, transistor measurement, testing diodes and continuity. This ergonomically designed mustimeter features an integrated tilt stand and durable curved rubber sleeve for excellent grip and protection from other gear while stored away. The PDMT29 comes with test leads, a hard rubber case, stand and manual. Rigid construction makes this ideal for use in the field, laboratory and workshop or for home and hobby applications. All Pyle products are backed by a one-year warranty. Full range overload protection. Requires 9V battery (not included).